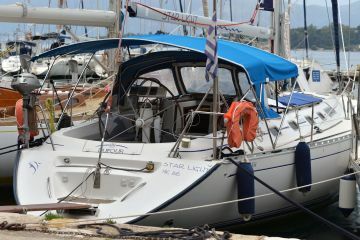 Dufour 454 Classic For Sale is lying in Corfu, Greece. At 14 metres (approx. 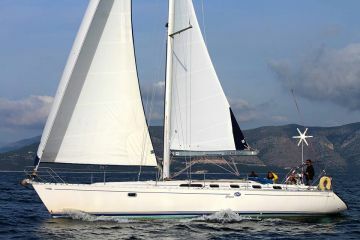 45.93 feet) this Dufour is a bargain at €78,500. 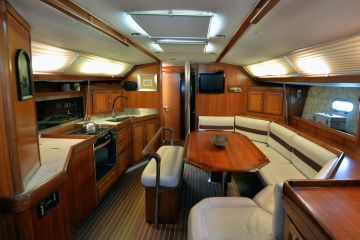 The Dufour 454 Classic is a yacht with great sailing abilities. Designed by the extremely successful J&J Design Group, she combines space and comfort with some exciting sailing. 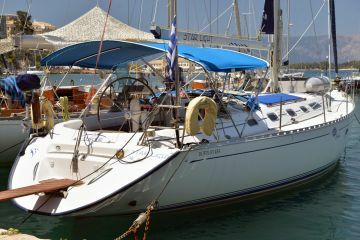 StarLight has a greek charter license and she is present in all booking engines. hence she has the potential to make a profit or at least cover the running costs depending on how much a new owner use her. We also offer to continue the yacht service for Starlight. We are modernizing our charter fleet and looking into purchasing a smaller but newer yacht. The yacht itself has, due to her deep keel, exceptionally good sailing characteristics. Very good is also the level of maintenance. Everything works and there are many personal details and lot of accessories that make life on board pleasant. The genoa is new, the main three years old. Batteries have been changed this year. The engine is constantly maintained and has no problems. Alternator, water pump, heat exchanger, overhauled. Other extras are: wind generator, electric heating panel, seat cushion for the deck, TV, inverter, dinghy with outboard (Honda2.3). 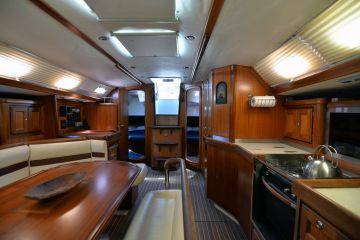 Boatmatch Tip: Want more advice about buying this Dufour 454 Classic? Checkout our Boatmatch Buyers Guide! Boatmatch Tip: Need advice about possibly insuring this Dufour 454 Classic? Checkout our Boatmatch Insurance Guide! Electric toilet. 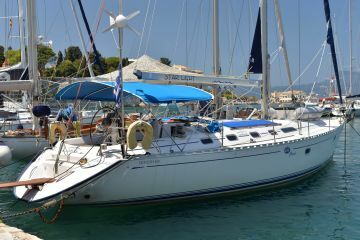 Contact the seller of this Dufour 454 Classic for more details. 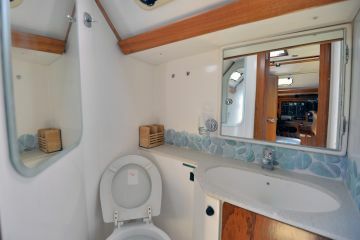 Chart table to the right, bathroom with shower and electric toilet to the left, two double cabins aft, two cabins in the front with not quite double mattress down and bunks to the side. 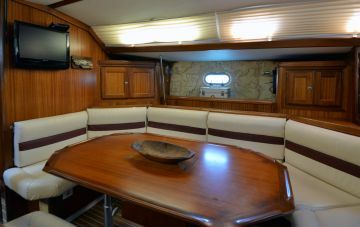 Galey with top load fridge on port and a comfy sofa to starboard..
Boatmatch Tip: Have a question about the accommodation of the Dufour 454 Classic? Contact the seller via clicking on the registering interest button above. All is looked after and everything works fine, see the pictures. And is in all the booking systems. She could easily pay the bills for a new owner. Ask me for details!!! !